Robichon’s will be teaching random free inline skate lessons as a benefit for Sarah in exchange for an optional donation to Operation Smile, an organization our former student and instructor Sarah Gutknecht volunteered her services to as a pediatric nurse practitioner. In March 2016, Sarah was diagnosed with pancreatic cancer. After a courageous, strong and inspiring fight with the disease, at the end of June 2017, with numerous metastases in the liver, Sarah was enrolled in hospice care given six weeks to three months to live. At the age of 54, Sarah passed away peacefully at her home the evening of August 24, 2017 with loving family by her side. During hospice care Sarah instructed us to “keep the rubber on the road”. 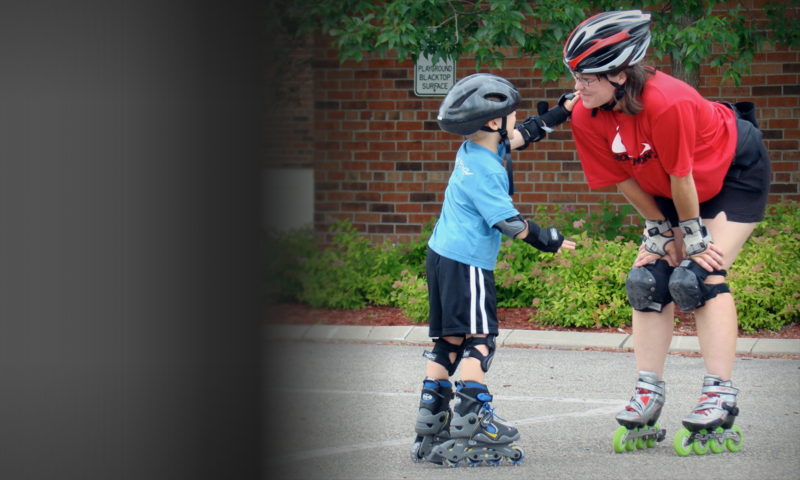 In keeping with her desire to have us keep inline skating (rollerblading) rolling, and to honor Sarah, ROBICHON’S began offering forty-five minute free inline or quad skate lessons, September 9, 2017, to any new skater or any skater struggling to stop on inline skates. In exchange, ROBICHON’S requests an optional donation to an organization Sarah strongly believed in, Operation Smile. Lesson dates, details and sign up can be found below. The basics of Inline Skating: Balance, using protective equipment, basic movement forward, basic slowing and stopping. Introduction to the sport of inline speed skating. *Professional Lessons from qualified instructors are the single best way to safely and effectively get rolling. We have a limit of seven participants per “Skate for Sarah” free class session, so please sign up early. Skate and Equipment Rental: We will be offering skate rental along with wrist guards, elbow and knee pads for a nominal fee of no more than $16. We also have a very limited supply of helmets. However, for hygiene purposes, we recommend you bring your own helmet. A bike helmet is the same as an inline helmet and works best as it should be fitted specifically for your noggin’. For a helmet fitting guide refer to Children’s Hospital Los Angeles blog on sizing and fitting helmets. Pre-Registration is required. Please use Skate for Sarah Sign up form for a free introductory session or skate refresher in exchange for an optional donation to Operation Smile. Our goal throughout the year is to raise enough funds for 20 operation smile surgeries. Raising $5000 will pay for 20 free operation smile surgeries. Click here to SIGN UP for a FREE Skate for Sarah skate lesson. Thank you for your support of Sarah, her love for inline skating and Operation Smile. Skate for Sarah sticker created with input from Sarah’s family.